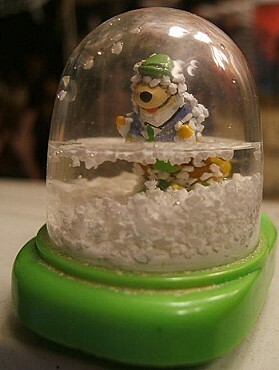 This miniature snow globe figurine features Yogi Bear – not in winter clothes, mind you, but in what appears to be at least the top-half of a baby blue tuxedo. The base is neon green, with some type of salt-like deposit crusted onto it in areas. It was copyrighted in 1995, made in China, and distributed by Arby’s. 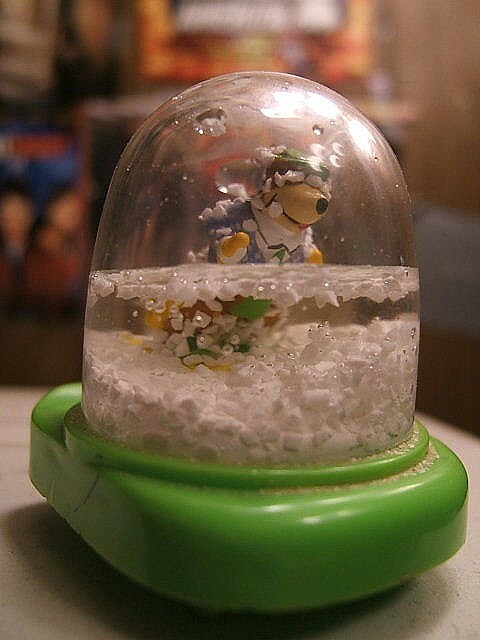 My particular globe is missing roughly half of its original water supply; a bunch of stray pieces of “snow” are now stuck to Yogi, like large clumps of salt, many covering his eyes leaving him blind to his current location. I like this particular piece because it has been nearby my computer desk for years, even though I can’t recall when or where I originally got it. Fast food tie-in toys are a giant genre themselves, and, there are tons of tiny treasures to find and cherish. The fact that it’s half-full is neat, too; it signifies to me that it has a lifetime of its own, and that life is halfway over.